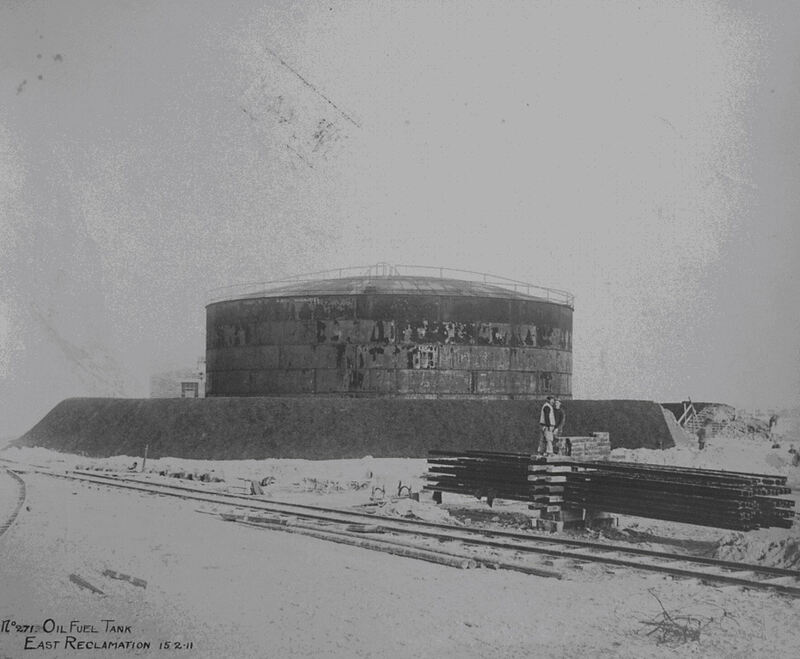 In January 1908 the erection of two oil tanks at the Eastern Dockyard, as Eastern Docks was then called, was agreed by Dover Harbour Board (DHB). By May that year, the foundations were laid. 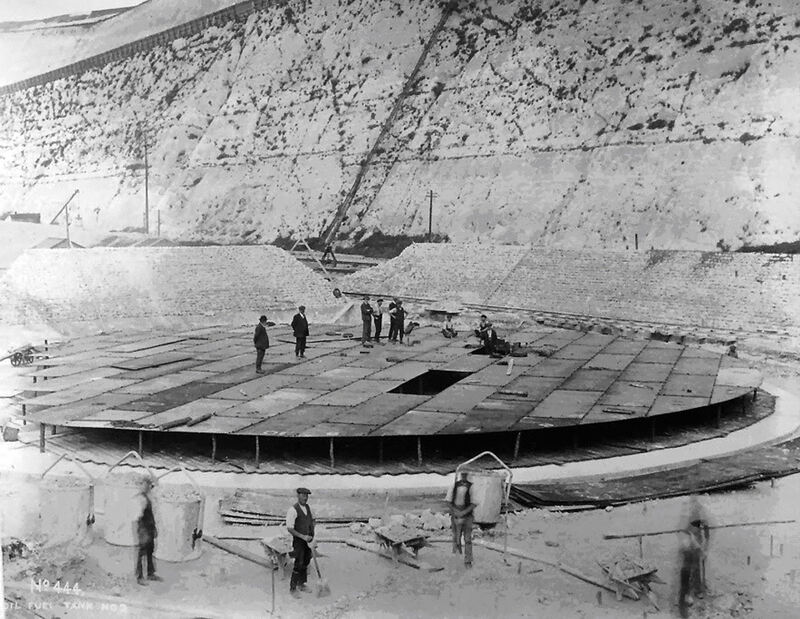 Completed in 1910 and costing cost £10,000, each could hold 110-tons of oil. In preparation for possible war, in 1913 this storage facility was increased at a cost of £5,800. 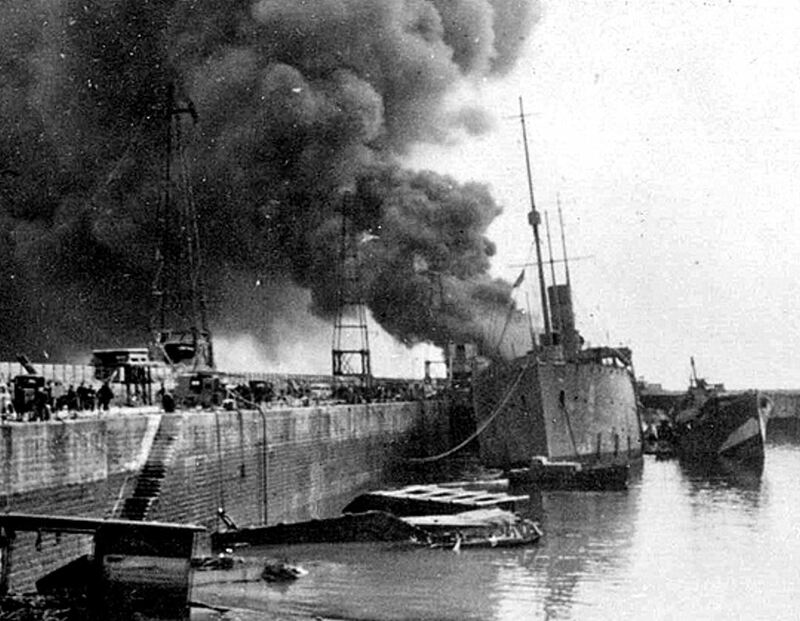 World War I broke out in August 1914 when the Admiralty took control of the Harbour. Due to an increasing number of vessels using oil instead of coal, storage facilities were created in the cliffs. It was replenishing the oil stocks at the Eastern dockyard that led, in 1918, to the building of the Seafront Railway. Following the War, the tanks and oil-caves were leased to the Shell-Mex Oil Company, a British company founded in 1897 for the purpose of transporting oil. Originally, called Shell, as the father of the founders was an importer of seashells; in 1919, they took control of the Mexican Eagle Petroleum Company forming Shell-Mex two years later. Much of the harbour was transferred back to DHB in 1923 and this included the oil storage facilities and caves. Slowly, an increasing number of cross-Channel ships were converted to oil and by 1926, the year of the General Strike, Southern Railway had four oil burning passenger steamers. As the coal strike deepened that year, oil was taken from the Eastern dockyard depot and distributed inland. By 1928 fuel carrying vessels were regularly unloading oil at the Shell Mex oil depot in the Camber. Larger tankers, carrying some 5,000 tons of oil and took about 24 hours to unload. Distribution inland continued as well bunkering ferries. 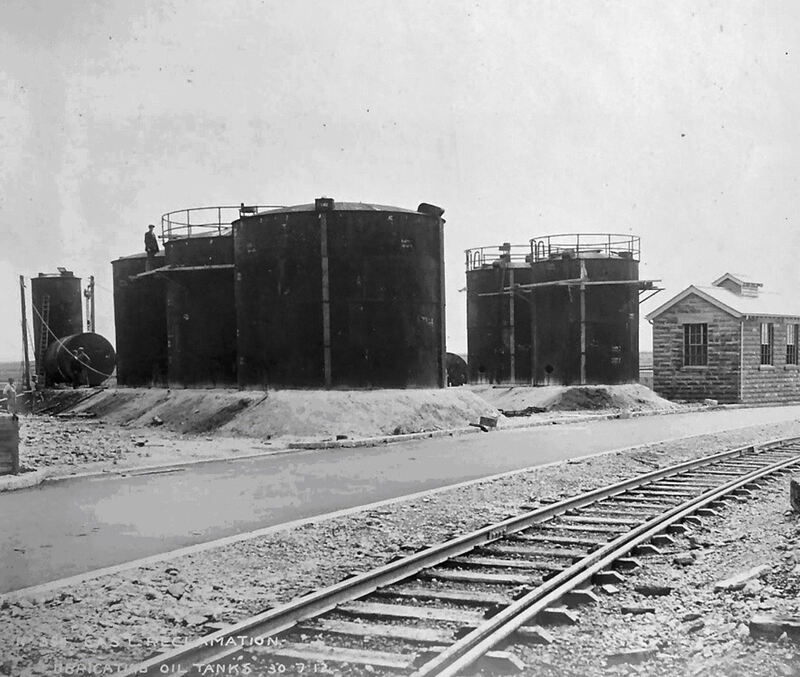 The fuel oil was taken for inland in large tanks on the Seafront Railway to connect with Southern Railway at Western Docks. The oil depot was expanded in 1931 and in September that year the Swedish oil tanker Paliux arrived with 14,000-tons of fuel oil for the Shell Mex Depot. She discharged half her cargo pumping 180-tons an hour through a hose. The remainder of her cargo was discharged at Havre. The following year (1932) the Prince Baudouin, built for the Dover-Ostend service, became the first cross-Channel ship to be fitted with Diesel engines at the outset. Although at this time Shell-Mex oil depot at Dover was proving profitable the firm as a whole was running into financial difficulties. To alleviate the problem its UK marketing operations were merged British Petroleum to form Shell-Mex and BP Limited an association that was to last until 1975. On 30 June 1933 Charles Johnson, one of the Shell-Mex workers, was accidentally killed when he fell from one of the oil fuel tanks. He was aged 58. At the outbreak of World War II in September 1939, the harbour was requisitioned and the Admiralty ordered that the capacity of the oil fuel caves to be increased. Four feeder oil tanks were also erected on Northfall Meadow. The oil caves still exist and I was able to visit them some years ago. They are reached by a 1,000-feet (305-metres) inclined tunnel and if memory serves me correct, followed by a flight of steps. Each tank was 600-feet (183-metres) long, 32-feet (9.75-metres) wide and 38-feet (11.6-metres) high and together held over 20million gallons of fuel. The tanks were linked to a pipeline along the Eastern Arm to fuel the ships. Dover’s police/firemen Ernest Herbert Harmer, Cyril William Arthur Brown and Alexander Edmund Campbell were awarded the George Medal for their part in saving several ships that day and the following two days. Following the war, in June 1947, the oil fuel and petroleum stores at the East Cliff were transferred to the Petroleum Board. They, in turn leased the caves and the original tanks to Shell-Mex and the war built tanks to Esso. Both used the facilities for fuelling ships. A year later, Dover Harbour Board took the decision to develop the Eastern dockyard, renamed Eastern Docks, as a main ferry terminal for vehicles. As an increasing number ferries were either being converted to or built for fuel oil an awkward back-shunt on the Sea Front Railway had to be dealt with. This was near to the Prince of Wales Pier and the alterations made it easier to carry fuel to Eastern Docks. The four oil storage tanks on Northfall Meadow were demolished by explosives in the mid 1950s. Esso rebuilt and extended their oil storage depot, which was officially opened by Dover’s Mayor Reg Snelgrove in May 1955. The new installation had a storage capacity of 1¼ million gallons and the firm had the intention of distributing oil throughout East Kent. Seagoing tankers by this time, brought in fuel to the depot and Esso used the Seafront Railway to carry the fuel to Western Docks. From there it was taken by the main lines to smaller distribution centres. 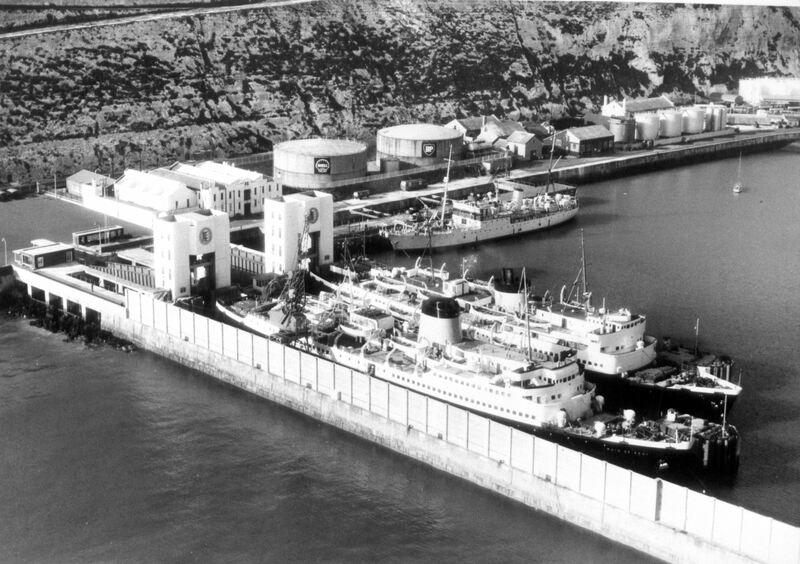 At Western Docks, British Railways constructed their own oil storage tanks from which they bunkered the cross-Channel vessels operating from that side of the harbour. The oil caves were decommissioned in the 1960s and sealed off behind steel doors. When a direct rail connection to the main line was provided for the Isle of Grain oil refinery, oil was delivered by tanker wagons to sidings near the Marine Station. This led to the decommissioning of the Shell-Mex oil storage facility. The two giant tanks were removed in 1971 followed by the remainder of the depot. This provided additional parking space for lorries and imported cars at Eastern docks. In September 1985, Esso closed down their depot and work immediately began on demolishing the plant. This entry was posted in Eastern Docks - Oil Installations, Port and Transport. Bookmark the permalink.